The most important of the four sites that constitute India's Char Dham pilgrimage, Badrinath Temple is dedicated to Lord Vishnu and is located in Bardrinath, which is a holy town in the district of Chamoli in Uttarakhand, India. Situated along the Alaknanda River, Badrinath Dham is considered to be one of the holiest temples by the Hindus. The main attraction of Badrinath Dham is the one meter tall statue of Vishnu in the form of Lord Badrinarayan which is cast in black "Shaligram" stone. The statue is known to be one of the eight self-manifested statues of Vishnu and is securely placed under a Badri Tree which has a gold canopy. A noticeable aspect of the temple is there are a number of hot springs around it. Every year the temple is open for visitors for a period of six months, starting from May and extending till the start of November. 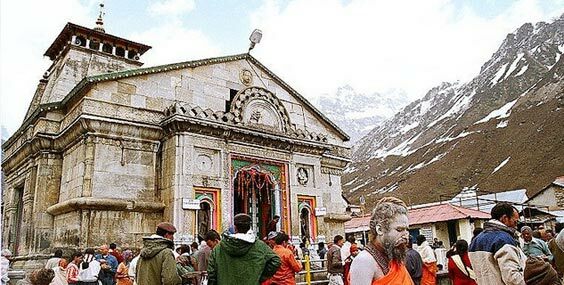 Though there is no historical record as such, some mentions about the presiding deity Badrinath can be found in Vedic scriptures which seem to suggest that the temple has its origins dating back to the Vedic period. There are also some claims that the temple was a Buddhist shrine till the 8th century before Adi Shankara played his part in transforming it into a Hindu temple. This argument is supported by the fact that the temple architecture resembles a Buddhist vihara (temple); its brightly painted, typical of a Buddhist temple, lends more credence to this argument. Other accounts say that Adi Shankara helped the temple find currency as a pilgrimage site in the ninth century. The Shankara is said to have lived in the place for six years between 814 and 820 AD. The prevailing Hindu belief is that he found the image of Badrinath in the Alaknanda Rive which he enshrined in a cave near the hot springs. The structure of the temple as is evident today was built by the Garhwal kings. The temple is made up of three sections - Garbhagriha (Sanctum), The Darshan Mandap, and Sabha Mandap. In the Garbhagriha section, one can find the idols of Lord Badri Narayan, Kuber (God of wealth), Narad Rishi, Uthavar, Nar & Narayan. Lord Badri Narayan –who is also known as Badri Vishal – can be seen armed with a Shankh (Conch) and a Chakra in his two arms in a lifted posture and two arms rested on the lap in Yogamudra. The principal image, which is cast in black stone, represents Vishnu seated in a meditative pose. Besides, the temple is home to Garuda (Vahana – the vehicle of Lord Narayan) and Goddess Mahalaxmi. Even idols of Adi Shankar, Swami Desikan and Shri Ramanujan exist here. There are two natural hot water springs in the pilgrimage center- Tapt Kund and Surya Kund. The waters at these springs have a temperature which remains constant at 55 °C throughout the year. It is believed that taking a bath in these springs purifies the mind, body and soul; bathing is generally done before entering the temple. 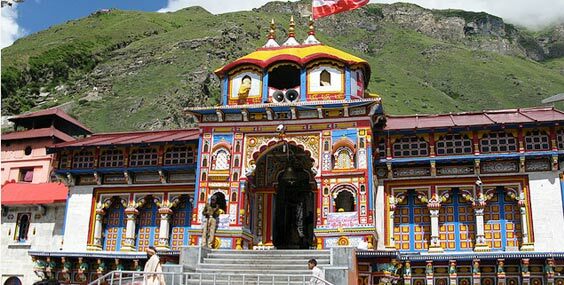 Vishal Badri: It refers to the main Shri Badri Narayan Temple which is considered to be very sacred by the Hindus. 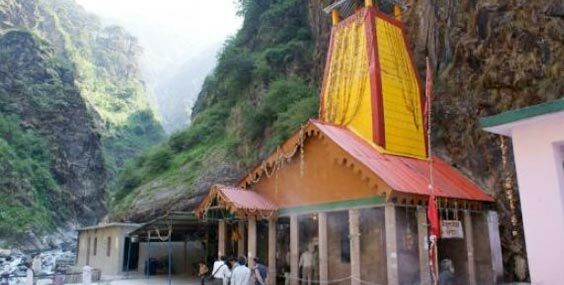 Yogathyan Badri: Located at a distance of 24 kms from Badri Nath and 20 kms from Joshimath, Yogathyan Badri is believed to be the place where Maharaj Pandu (the father of the Pandavas) prayed to Pandukeshwar. Bhavishya Badri: It is a small village located some 17 kms away from Joshimath. Preetha Badri: It is located at a place called Animath, which is 17 kms from Joshimath. Adi Shankar is believed to have worshipped Lord Badrinath here for some time. Adi Badri: It is located at a distance of 16 kms from Karnaprayag. Here one can find many temples from the Gupt Dynasty; among these temples, the Mana Narayanan temple is the most popular. Located at a distance of 3 kms from Badri, it is the last Indian Village situated on the Indo-China Border. It has managed to capture the public imagination on account of being home to the Vyas Caves; it is believed that Maharishi Vyas (a sage), author of the Mahabharata, lived in these caves. The village, which sits on the banks of the River Saraswati, is named after this great sage who, in fact, completed the epic in these caves itself. Vyas was actually obeying the orders of his mentor Kalpatru Maharishi, who advised him to start working on the epic. The Mahabharata depicts the history of the Pandavs, the Kauravs, as well the famous Kurukshetra War. Importantly, the Bhagawad Gita, which literally means the song of the Bhagavan or Krishna, is also a part of the epic. Ganesha, one of the best known and most-worshipped Hindu deities and the son of Shiv & Parvati, rendered his help to the sage in completing the mammoth task. Besides the Mahabharata, Maharishi Vyas was also responsible for composing 18 puranas, Brahma Sutras apart from classifying the Hindu Vedas into 4 parts - Rig, Yajur, Sama and Atharva. People believe that it is in these caves where Adi Shankara met Vyas Maharishi and discussed with him his Bhashyam (explanatory notes) for Brahma Sutras. The rock formations inside the Vyas Gufa bear close resemble to the orderly stacking of palm leave manuscripts - oldest writing material – and are worshipped as Vyas Pusthak. Many in fact consider Maharishi Vyas to be a reincarnation of Vishnu. One of the most idyllic parks, it was discovered by Frank S. Smythe in 1931. The valley is filled with a plethora of vibrant flowers, which is why the park is named so. Nearby the park, the River Pushpavati flows by, while the massive Rataban peak makes for a stunning backdrop. Vasuki Tal: It is a high altitude lake which can be reached by undertaking an 8 km trek; the maximum elevation of the trek can reach up to 14,200 feet. Vyas Gufa, Ganesh Gufa, Bhimpul and Vasudhara Falls are within a range of 3-6 km from the lake. Most of these places are famous for their association to Hinduism and one can find many fascinating legends associated with them. The first math to be established by Shri Adi Sankara, it is located at a distance of 14 kms from Helang via Badri. It is believed that Adi Sankara got enlightenment here and authored Sri Sankara Bhashyam. It is located at a height of 6150 ft above sea level. Here you will find separate temples of Lord Narasimha and Lord Vasudev (different forms of Lord Vishnu). It is one of the 108 Divya Desams (sung by the Sacred Vaishnavaite Saints). In the temple for Lord Narasimha, separate statues of Badri narayan, Uthavar, Kuber, Chandikadevi, Ram, Lakshman, Sita and Garud have been exhibited together in the sanctum sanctorum. Outside the temple separate statues of Brahma, Krishana, Lakshmi & Anjaneya can be seen. Maharishi Vyas is believed to have worshipped Goddess Lakshmi. The presiding deity of the temple, Lord Narasimha is believed to have been established by Adi Sankara. There is also the belief that one hand of the presiding deity is getting weaker and the day it comes apart, the road to Badri will get permanently blocked; once that happens Lord Badri Narayan will only give darshans from either the Bhavishya Badri or Adi Badri (part of Panch Badris). The temple of Lord Vasudev houses Lord Vasudev in the sanctum sanctorum along with other deities like Sridevi, Bhoodevi, Leela Devi, Oorvasi Devi & Balram. Further separate structures are available for Vinayaka, Brahma, Indira, Chandran(Moon), Navadurgas & Gauri Shankar. This place is believed to have been established by King Pandu, the father of the Pandavas. 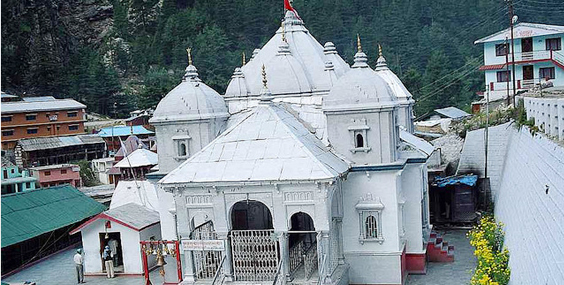 It is situated about 4km from Govind Ghat, 219 kms from Kedarnath and 24 kms from Badrinath. There are two temples - one of Lord Yogabadri Narayan and the other of Lord Vasudev. During winter, the temple of Lord Vasudev temple functions as the abode for Lord Badri Narayan and all the daily rituals connected to worship are performed here. Both the temples are quite old. The temple remains closed from October to April due to severe weather conditions. During this period the idols of Utsavo murti are taken to Pandukeshwar. Summer: Max: - 10.C. Min- 0 deg.C. Best Season: Mid April to June and September to October. Airport : Nearest airport is the Jolly Grant Airport, Dehradun, which is 315 km away. Railhead : The nearest railhead is at Haridwar, which is at a distance of 320 km. The ideal time for visiting the shrine is between May and November. One should carry sweaters, woolen clothing, umbrella and first aids during the trip. Travelling light is a wise idea. Non-vegetarian food and alcoholic drinks are strictly prohibited in this place.